Swiss pilot André Borschberg was soaring confidently over the Pacific, halfway through a five-day flight from Japan to Hawaii, when he glanced at his control panel. What he saw was alarming: 105 degrees. That’s how hot the batteries on his plane had become. And day by day he saw the number rise, eventually to an ominous 140 degrees. Borschberg had reason to be: His plane, the Solar Impulse 2, is powered entirely by those solar-charged batteries, and a loss of power would mean a slow descent and crash in the middle of the ocean. By the time the plane set down in Honolulu after 118 hours — nearly five straight days — it had smashed the record for the world’s longest solo flight. 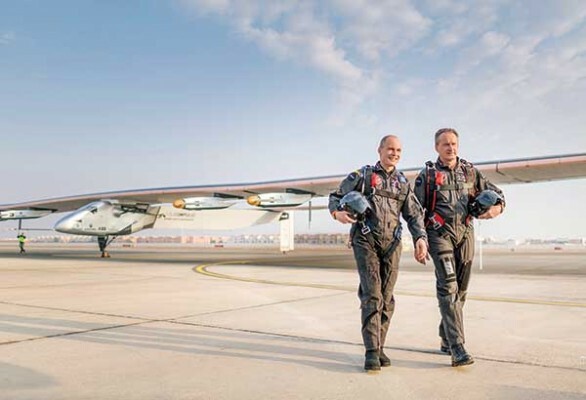 It also became the first solar-powered plane to fly such a distance, more than 5,000 miles. The plane — which has 17,248 solar cells covering its wings, tail, and fuselage — is the brainchild of Piccard. A psychiatrist who comes from a family of Swiss adventurers, Piccard made his mark in 1999 as the first man to travel the world nonstop in a balloon, which took more than 19 days. But he’d long held on to a fantasy of being able to “fly forever” via solar power. With Borschberg on board as his partner, Piccard set out on a decadelong journey to prove that the sun’s energy could power a plane. To fly forever — or as close to it as possible — the plane would need to ascend to 28,000 feet during the day to collect solar energy, then slowly descend at night while running on battery power, and then repeat the process. After successful tests with the first Solar Impulse plane in 2010, which included a night flight over Europe, construction of the second, larger Solar Impulse 2 began soon after. The goal was an around-the-world tour highlighted by the record-breaking Pacific flight. In March, the two men set off from Abu Dhabi, alternating flying the single-seater. After stops in Oman, India, and China, Borschberg was scheduled to fly directly from China to Hawaii, the longest leg of the journey. But bad weather forced him to land in Japan, and the plane was grounded for a month after sustaining damage from wind and rain. With carbon fiber wings longer than a 747’s, the plane — which has a top speed of 40 miles per hour — is extremely delicate. When he eventually left Japan, the autopilot warning system, which would allow him to take naps during the flight, failed to kick in. “All the engineers said, ‘You have to go back to Japan,’ ” says Borschberg. But the team devised a primitive workaround: Every 20 minutes they would place an alarm clock next to a microphone at mission control, waking up Borschberg with a loud buzz. Besides that, the flight seemed to be going smoothly, at least until the battery temps started rising. Borschberg had tested the team’s repairs to the wings by making two consecutive ascents after taking off from Japan. The climbs put added strain on the batteries, and Piccard and Borschberg didn’t realize how serious the issue was until the plane landed in Hawaii: The batteries had actually begun to boil and turn gaseous. The plane is now grounded for several months while new ones are installed. So the next leg of the flight — across the second half of the Pacific, then over the States and ending in Abu Dhabi — will be delayed until spring. But even with that setback, Piccard says he’s already proved his point about solar power.